Read the Purdue News Service story. WEST LAFAYETTE, Ind. — A multidisciplinary project is bringing three professors from multiple Purdue colleges together for research improving training and potential interest in the scientific field of cryo-electron microscopy (cryo-EM). The National Institutes of Health today (May 15) announced a three-year grant totaling $367,347 for the work of Yingjie “Victor” Chen, a professor of computer graphics technology in the Purdue Polytechnic Institute; Wen Jiang, a professor in biology from the College of Science; and Bill Watson, an associate professor in learning design and technology from the College of Education. To help manage the project, the trio is joined by Thomas Sors, assistant director of the Purdue Institute of Inflammation, Immunology and Infectious Disease. According to the team, demand for existing training opportunities exceeds capacity and its expected this demand will rise as adoption of cryo-EM technology continues to increase. “It’s been extremely exciting research in recent years, but the learning curve is very steep,” said Jiang, director of the Purdue Cryo-EM Facility. “Right now, we recognize the current training approach is very limited. It’s not efficient, it’s not high quality. The grant is part of the NIH program for Cryo-EM Curriculum Development. The funds will support creative educational activities with a primary focus on curriculum or methods development in cryo-EM for structural biology research. 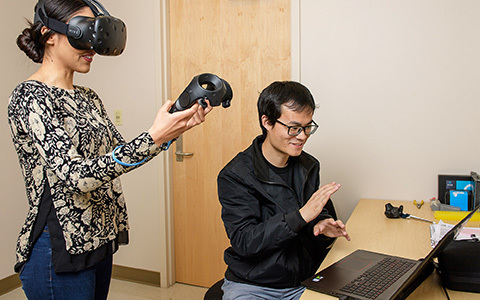 “This is really about tactile learning, the hands-on training opportunity,” Chen said of the project, adding the VR program lends itself to trainee’s muscle memory by allowing the person to handle the machine repeatedly. Floating hands on a laptop screen show the VR user putting their sample on a virtual a cryo-electron microscope for preparation of cryo-EM grids and reaching for a lineup of tools to the right. The sample placement and the tools react as the user interacts with each while, in the background, a video shows the user the proper technique. “We’re trying to just give the user a personal experience in the environment,” Chen said. The team also is working on creating new VR tools that simulate other cryo-EM instruments and sequence of operations. Purdue’s Cryo-EM facility has been part of the field’s recent momentum, as it was used by a team led by Purdue researchers in determining the structure of the Zika virus in 2016. Putting together the VR program, however, is more than just graphics on a computer screen. Making sure the system is adaptable to users is where Watson joins the work. Watson said the VR program gives users a safe space to learn that they normally wouldn’t have access to while also giving them a key place to fail in the process. Previous training modules supported by the NIH are excellent and include video trainers, Sors said, adding the intent of the Purdue project is to incorporate those into the CryoVR environment. The inexpensive nature of VR goggles today will allow more people to take advantage of the training platform. He said the Purdue Institute of Inflammation, Immunology and Infectious Disease helped link this team together and is interested in continuing to foster the professors’ collaborative work, noting Purdue is the only university with cryo-EM facility in Indiana.